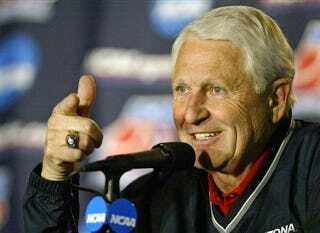 Lute Olson, a name often mentioned in the same breath as John Wooden, will now be mentioned in the same breath as backwards Game hats and conch shell necklaces. That's right, a press release from Pi Kappa Alpha informs us that the Silver Fox is now a member of the fraternity known collectively as the Pikes. Olson was sworn in by the Arizona University chapter of the fraternity and is justifiably ecstatic to have made it through the grueling pledge process. "It is a nice feeling to be a part of this organization; I am looking forward to finding more ways to support Pi Kappa Alpha." Olson's induction is more of a formality than a surprise. He's a legacy name at the school, with a ton of cash and a sweet nickname—it was bound to happen.